The Alameda County Fairgrounds is a 270-acre (1.1 km2) facility located in Pleasanton, California. It is home to the annual Alameda County Fair as well as numerous trade shows and community events. 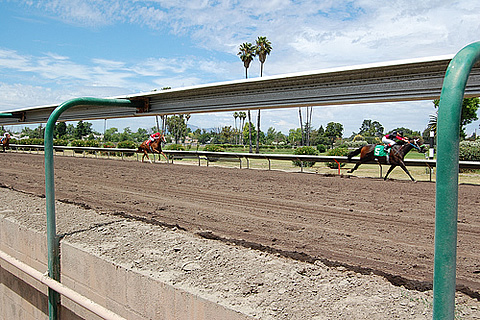 Its racetrack was built in 1858, making it the oldest one-mile (1.6 km) horse racing track in America. There is a 3,000 seat amphitheater, as well as a 9-hole golf course located within the track's infield. The Alameda County Central Railroad Society has maintained a model train exhibit at the fairgrounds since 1959, which has grown to two 15 foot by 100 foot layouts in O scale and HO scale.